The first mention of the upper Potomac and its environs to Indian Head, 30 miles south of Washington, is made by Captain John Smith exploring from the Jamestown Settlement in Virginia 1608. In 1634 Henry Fleet who was taken captive by Indians, visited the falls of the Potomac. In 1633 a tract of land (400 acres) called “Rome” was laid out for Francis Pope, Gentleman: the Capitol is said to be on this land. In 1790 the region in which the city of Washington was to be built was in the form of large farm tracts, covered with woods and watered by Streams, the arable portions of which were tilled and produced wheat, maize and tobacco. Two hamlets, Carrollsburg, in the south and Hamburg, southeast of the bustling port of Georgetown were within the limits of the early survey. On April 30th, 1783, nineteen days after the proclamation of peace between the American Colonies and England, the subject of a permanent capital for the general government of the States was alluded to in Congress. After much discussion on July 16th, 1790, the bill was passed providing not only for the temporary seat of government at Philadelphia, but authorizing the selection of a permanent site on the upper Potomac for a National Capital to be ready ten years later, or December 1800. “Where are thy men of might, they grand in Soul? January 22, 1791, President Washington appointed three Commissioners for the new city, Daniel Carroll and Thomas Johnson of Maryland, and David Stuart of Virginia. January 24, 1791, the President directed these gentlemen to lay down four experimental lines of boundary of the “ten mile square.” A survey was made from Alexandria Court House south to Jones Point on Hunting Creek at the Potomac. From this initial point a line was carried due N. W. 10 miles; then (into Maryland) due N. E. 10 miles to a Northern boundary point; thirdly due S. E. 10 miles; lastly due S. W. 10 miles, or back to Jones Point. This survey was approved by Congress with the amendment that all public buildings should be erected on the Maryland side of the Potomac. March 29, 1791, President Washington arrived on a visit to the Potomac and put up at Suter’s Tavern in Georgetown. The next day accompanied by the three Commissioners and the surveyors, Major Pierre Charles L’Enfant and Andrew Ellicott, he rode over the ground. 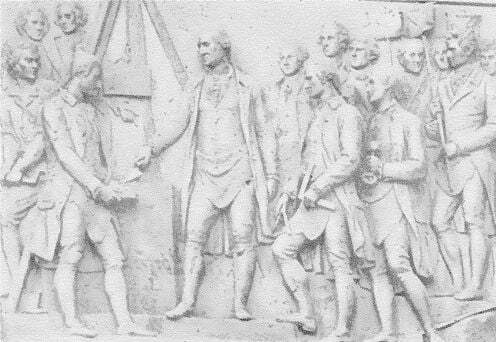 The same night Washington met the property holders of the land, and general terms were agreed to and signed by nineteen “original proprietors”. Thereupon the three City Commissioners were ordered to have the boundary lines permanently marked (see Boundary Monuments). The area of 100 square miles embraced about 64 miles of Maryland soil (ceded previously in 1788) and about 36 miles of Virginia soil (ceded in 1789). The city has had 21 Mayors from 1802 to 1870, and two Governors, 1871-74. It was Governor Shepherd whose drastic city improvements paved the way for modern Washington and secured its Stability. In 1874 the territorial form of government under a Governor was abolished and a government of three appointed Commissioners adopted. The most important act of Congress relating to the District was passed in 1878 – providing that the U. S. Government should share equally with the citizens of the District in the expense of maintaining the Nation’s Capital. Since then the development of the city has Steadily gone forward and today L’Enfant’s plan on a scale of magnificence far exceeding his times has been approached though never fully realized. At the 1920 census the population of the District was given as 437,531.